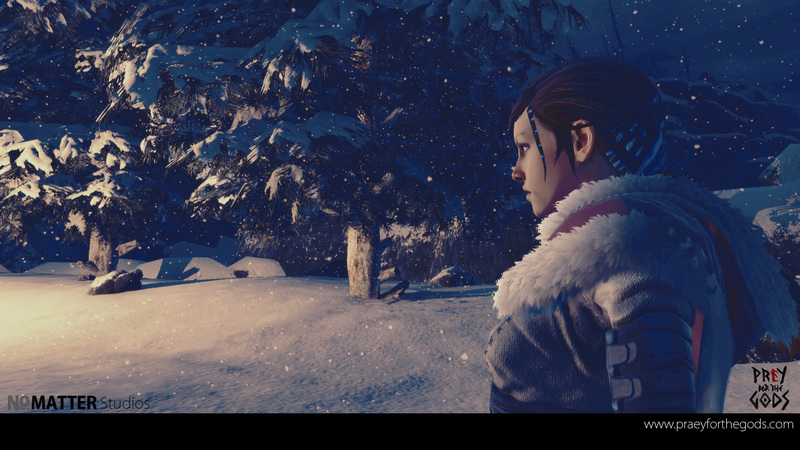 We’re still pushing towards our Closed Alpha. Tim got in an our updated item system as well as an iterated UI that’ll make picking up items and equipping etc much easier. Chien got in group AI and is focusing on what we’re internally calling “Champions” as well as some nuts/bolts to our game system like save/load. Oh and the “magic bullet” for our physics collision. “Magic bullet”? Can you elaborate? Sure! With typical physics there are limitations that usually are based on a number of different factors. For example, climbing on a giant boss that moves pretty fast. To get the collision detection to work so that our player doesn’t fall through the boss is no easy task. Prior to the bird this wasn’t an issue but once work began on the bird these issues arose and we couldn’t put it off any longer. After much work, and much math Chien was able to get this to work! Chien likes to call it the magic bullet because most ways to solve this requires a number of clunky work-arounds and thankfully Chien was able to get it completed in a clean and efficient way. Trust us this is a big deal. We also got to iterating on our items and UI. Please, remember these are still work in progress and subject to further iteration and refinement. We’ve implemented a better hot swap system for weapons. Prior to this we were using mouse wheel only which got cumbersome if the player had multiple weapons of the same type. Ie: press 1 for melee and those available melee weapons will appear. Press 2 for bow etc. Controller also has a similar setup. The inventory itself got a subtle face lift as well. While still minimal in design this was also done to help with usability. 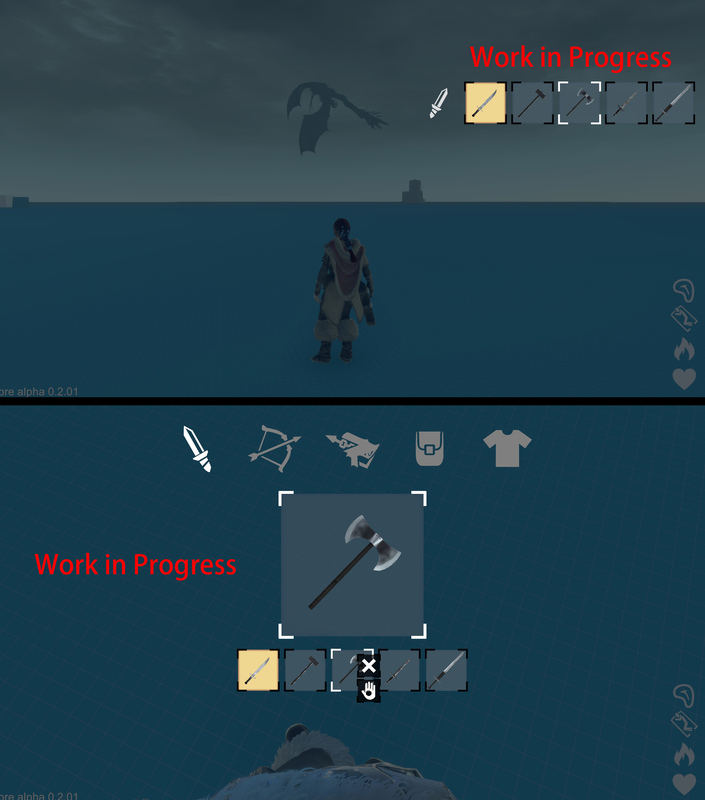 The pre-alpha UI was something we were trying out and we learned quite a bit from. Prior to that we had another UI and this is our latest. 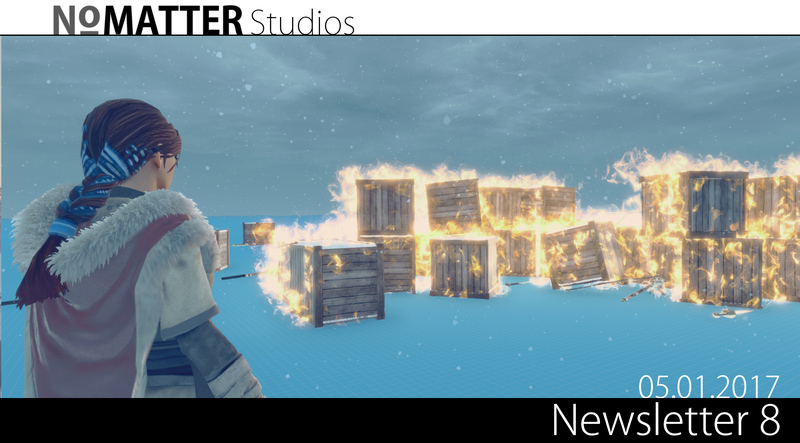 We’ve rolled out a more robust fire system, and now items can catch fire. Ie: the club can become a torch give off heat and then have fire damage against enemies. (Remember when we discussed that waaaaay back on Twitch right after the KS ended? Well it’s in now!) Crates as well can be lit and we’re just scratching the surface on how far we’ll go with it but for now it’s in and so we can start to build and adjust as we play around with it. Another update to go in was group AI, which allows our minions to swarm around the player and create a more tactical combat. Finally, we have our “champions”. They literally went in last night and we were testing it out and it’s incredibly promising. So what are “champions”? Think of them as a mini-boss of sorts somewhere between a typical minion and a boss. It’s still early to explain much more on them so the next newsletter I’m sure we’ll be able to discuss more. Wha!? Why are you now PRAEY for the Gods!? Oh yea that...so we didn’t want to do this but we had to change our game name from Prey for the Gods to Praey for the Gods. Thankfully we get to keep the logo but we will spell it “Praey for the Gods”. Honestly, we could make this entire newsletter about our thoughts on this. Trademark law is what we were dealing with and we aren’t under any NDA so we can state the opposition in this situation, Bethesda/Zenimax. We could’ve fought this and we did think about it for quite a while. Something like a trademark opposition can be long and depending on how far someone wants to fight it can be very expensive. We didn’t want to spend our precious Kickstarter funds, nor did we want to have to ask for additional funds to fight this in court. Using backer money towards something that doesn’t go towards the development or backer rewards felt horrible to us. Even if we did win we’d have to spend a solid chunk of our funds and in our opinion it wasn’t worth it. The truth is we initially thought about naming the game Præy for the Gods prior to our initial trailer. The logo has both the woman praying against the duality of prey, and thankfully we get to continue to use that. We figured people would have a hard time trying to type in the æ symbol in search engines etc. This was back in 2015 when we posted a trailer on Facebook and Twitter with had no idea if 100 or even 1000 people would watch the trailer. We were applying for both Prey for the Gods, and Præy for the Gods trademarks shortly after as we realized the extent of what we were making. Unfortunately, Zenimax chose to oppose our mark, as they felt both were too similar to their mark “Prey”. While we disagree with their opposition we were able to come to an agreement. It was something that kept me up many nights, and no doubt shifted our focus from our game frequently. Worrying about the outcome if we went to trial, if we’d lose our fans or walk away from the mark and still potentially get sued for millions on trademark infringement. This is really something no starting company should have to deal with let alone a tiny team of 3. So the fact that we came out the other end intact still developing the game was a win. One that will no doubt shape our company moving forward. Anyways, we have a forum! Forums can be a great place to relay information as well as discuss and respond to feedback from our community. We’ve been tinkering on the forum for a bit now but we might have some kinks to work out still. However, we have some great moderators that have been supporting us on our Discord chat and they will be assisting us on our PftG Forums. 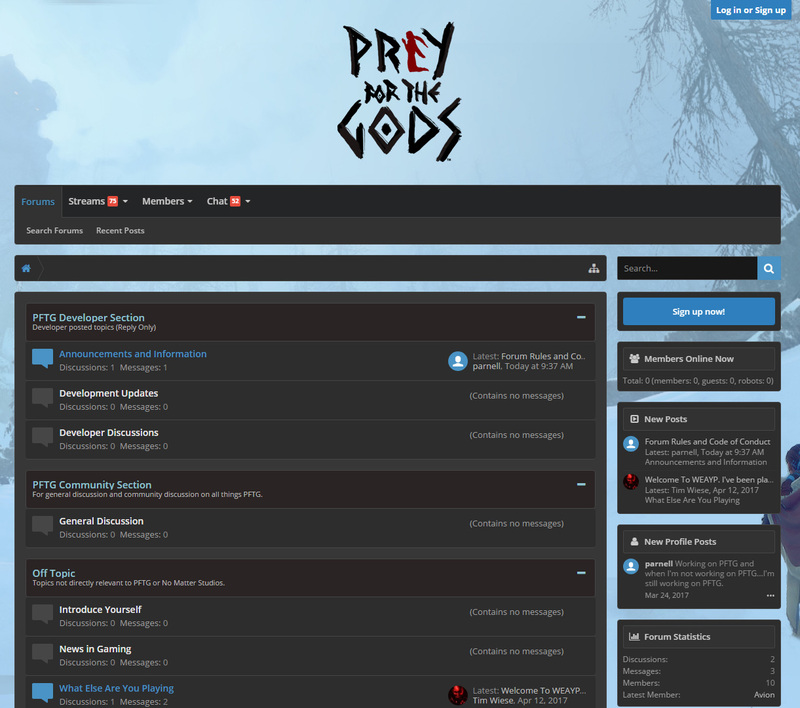 We plan to also use the forum as a way for us to receive feedback during our closed alpha and closed beta. In the end, a forum is as good as the community that uses it so please join us and make this a great spot to talk all things PftG:) The forum is pretty robust with a trophy system, and a way to share your favorite streams as well. Down the road we might look into badges that are assigned by backer level too! Still making the push for our Kickstarter Closed Alpha. Thankfully the end of May will mark the completion of most if not all large tech features. This is very good news as it’ll allow us to focus on content, and polish. The truth is we initially thought about naming the game Præy for the Gods prior to our initial trailer. The logo has both the woman praying against the duality of prey, and thankfully we get to continue to use that. We figured people would have a hard time trying to type in the æ symbol in search engines etc. This was back in 2015 when we posted a trailer on Facebook and Twitter with had no idea if 100 or even 1000 people would watch the trailer. We were applying for both Prey for the Gods, and Præy for the Gods trademarks shortly after as we realized the extent of what we were making. Unfortunately, Zenimax chose to oppose our mark, as they felt both were too similar to their mark “Prey". While we disagree with their opposition we were able to come to an agreement.